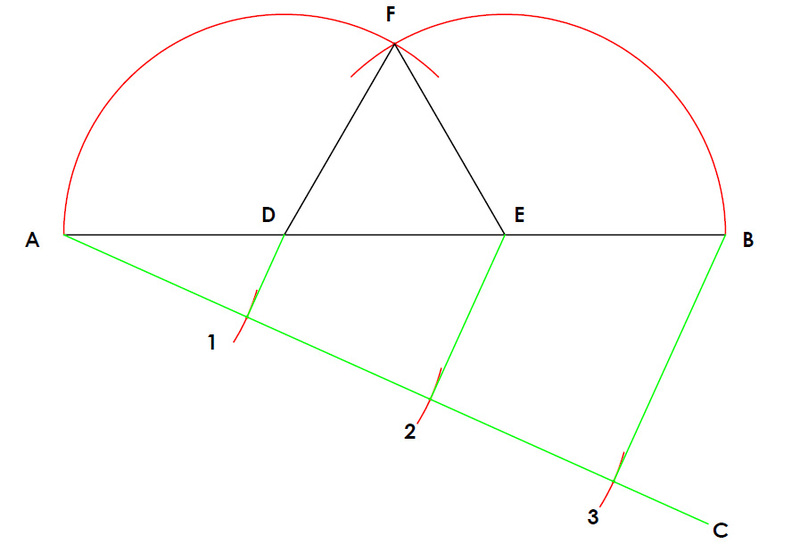 How to construct an equilateral triangle given the perimeter. First of all we draw a straight line equal in length to the perimeter. (Line AB) We should know that in an equilateral triangle the three sides are equal in length, therefore if we divide the perimeter up into three equal parts, we will be able to make the required triangle. We divide the perimeter into three equal parts by using the dividing of line into equal parts principle. if you are unsure of this follow the link below. Mark off three steps using your compass, using the same radius. Join the third arc back to point B. Bring the second and first arc back parallel to the line B3. Where these lines meet the perimeter line we drew at the start give us two new points D and E.
Next we get our compass and set the distance AD and swing from point D and point E. Where the two arcs meet creates a new point F. Join point D to F and point E to F, creating an equilateral triangle.